Until last Monday, I hadn’t spent much time in the Chiwaukums. I’d been up Chiwaukum Creek a couple times, and I’d also done a fun little loop out of Scottish Lakes High Camp during larch season. But I hadn’t done any real exploring and didn’t have a good sense of the geographical layout of the Chiwaukum range. I decided to change that by putting together an early-season Chiwaukum traverse. I traveled on foot (a little hiking, a little running, a little slogging) from the Chatter Creek trailhead (TH) to the Lake Ethel TH, and used my bike as a shuttle between the two. More specifically, I parked my van at the Lake Ethel TH and rode down Hwy 2 and up Icicle Creek Rd, stashing my bike in the trees near the Chatter Creek TH. Then I climbed up to Icicle Ridge via the Chatter Creek trail and traversed past Lake Edna and Cape Horn to (Hey) Ladies Pass. With that classic stuck in my head for the rest of the trip, I traveled down Chiwaukum valley on the Chiwaukum Creek trail, and then used the North Chiwaukum Creek trail to connect to Scottish Lakes, before finally exiting at Lake Ethel. The traverse turned out to be ~31 miles and 10k of elevation gain, and the bike shuttle was 36 miles and 1800 ft of gain. You can view the route here on Caltopo, or right click the image below. Bike shuttle: I chose the direction of the bike shuttle based on the fact that I wanted to ride my bike down Highway 2 (rather than up it) in order to move quickly and spend as little time as possible on the busy highway. My goal was to leave at first light, but I was running a bit late and started at 545. At that time of day there was still minimal traffic on eastbound Hwy 2 and I had a blast cruising through Tumwater Canyon. I turned right on Icicle Creek Rd and slowly pedaled the rest of the way up Icicle Canyon to Chatter Creek TH. I rode my old road bike (2006 Specialized Ruby). Wish I’d brought my gravel grinder instead – even though there were only ~5 miles of gravel roads, they would’ve been much more comfortable on fatter tires. At Chatter Creek TH I ditched my bike, transitioned into running gear, and was headed up the trail around 900 am – a little late for my taste, but luckily clouds kept the sun from getting too brutal. The Chatter Creek trail is in great shape from the trailhead all the way up until you first cross Icicle Ridge at 6600 ft (approx 4 miles from the trailhead). A steep climb, but there are some nice views to distract you along the way. Index Creek valley as seen from the top of Icicle Ridge. Apparently it’s a brushy nightmare, but it sure looked pretty from here. Once you drop down the north side of Icicle Ridge, there are still several significant patches of snow covering the trail (see pic below). I used microspikes, but the snow was soft enough that I’m not sure the spikes actually made a difference – I just would’ve felt really stupid if I’d slipped on the slope with spikes in my pack instead of on my feet. I was glad for my trekking poles. Didn’t bring an ice ax, and didn’t miss it. The north side of Icicle Ridge. You can see the bootpath running diagonally from left to right in the middle of the frame. Looking back up one of the steeper sections of snow on the north side of Icicle Ridge. The three small rocks in a row on the far right in this picture are the same three rocks just to the right of the bootpath in the previous picture. Lake Edna was a little alpine lake wonderland, more scenic than I imagined. I was engrossed in taking pics of the lake when I noticed movement to my right. A small family of goats were peering at me over a nearby hill. Happily, these goats did not seem habituated to people. They watched me cautiously, and then took off running down the slope to the lake. Not two seconds later I heard some scratching in the snow. Expecting another goat, I looked behind me and saw a giant marmot emerging from his den. He took one look at me and started galumphing across the snow. I wished my daughter were there to see it – she would’ve thought he was “sooooo cute!” (as confirmed when I showed her pics). Someday soon she’s gotta see one of those guys in person. After Lake Edna I skirted Cape Horn, which required traversing a few lingering patches of snow. Again, the snow was relatively soft and easy to kick steps. However, a fall wouldn’t have been good. Cape Horn had some long run-outs with rocks at the bottom; one of those situations with low risks but bigger consequences. For some reason it felt sketchier to me than the north side of Icicle Ridge – probably just a bit steeper. I was alone and hadn’t seen anyone since I left the Chatter Creek trail (and wouldn’t see anyone else the rest of the day), so I took it slowly on these slopes as well as in a couple of other places that had me out of my comfort zone. From Cape Horn, I dropped down to Ladies Pass. The wildflowers seem to be peaking there right now. In addition to the red paintbrush, there were lots of yellow and purple jobbies (that’s their latin name). Paintbrush for days. This pic doesn’t do it justice. From Ladies Pass, I picked up the Chiwaukum Creek trail. This trail also had some snow lingering above 6000 ft, but it was all relatively low angle and easy to navigate. In general conditions were mixed along Chiwaukum Creek. The trail faded away occasionally in the meadows directly below Lake Brigham, and then became very brushy before intersecting with the Index Creek trail. After Timothy Meadow there is an amazing section of clear runnable trail, all the way down to the intersection with the North Fork Chiwaukum trail. North Forth Chiwaukum… this was not my favorite trail. The first section travels through a sooty burn with occasional blow-downs, before becoming brushy and mosquito-ridden with more blowdowns. The actual North Fork of Chiwaukum Creek was running high and fast. I noticed a cairn on the opposite bank, but crossing at the cairn would’ve required fording the creek just upstream of a waterfall. Maybe at lower water that’s the best place to cross, but it did not look good to me. I spent a good 40 minutes wandering up and down the streambank before finally crossing on a slick wobbly log below the falls. After crossing the North Fork Chiwaukum, the trail begins a steep brushy climb. I can’t imagine this section of trail has been maintained or even seen much travel in recent years. Unsurprisingly, this where I hit a rough patch. I was mentally exhausted from trying to find a way across the river, the whole trip was taking much longer than I anticipated, it was getting dark, and I was tired of fighting slide alder. Waaaah. On the plus side, as soon as Chiwaukum Lake came into view, it was as though someone had waved a magic wand and instantly made the trail perfect. Thank you to whomever did all that work! McCue Ridge trail was completely clear of brush and blow-downs, and a lovely gentle grade. Conditions stayed near-perfect all the way through the Scottish Lakes area, including the trail to Lake Julius as well as the Roaring Creek trail to Lake Ethel. 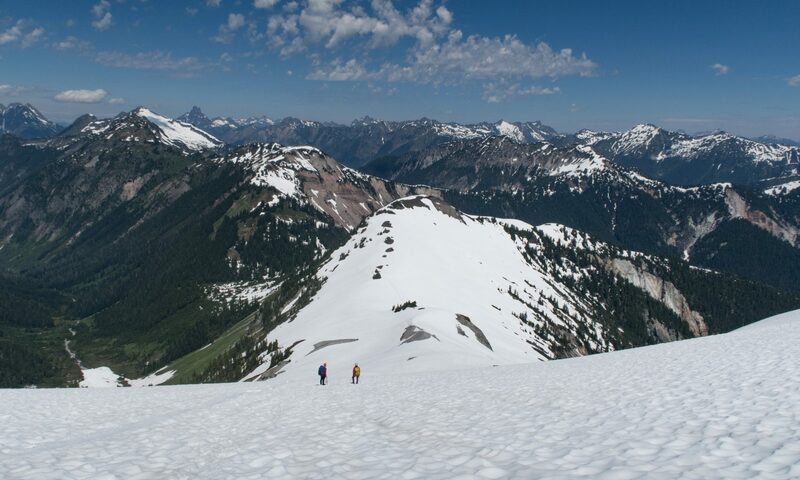 (Hiking season starts at High Camp on July 25 – get some! And no I’m not affiliated with them. I just love the place 🙂 ) From Lake Ethel down to the trailhead was also in great shape, but man it went on forever. I finally reached the van after midnight, and proceeded to immediately fall asleep in the back. The next morning I woke up, picked up my bike from the Chatter Creek trailhead, and stopped at O’Grady’s for coffee and a delicious still-warm-from-the-oven scone. That scone alone was reason enough to do the Chiwaukum traverse. Not to mention the beautiful scenery, solitude, wildlife, alpine lakes, and warm scones. Looks like a beautiful day out. The picture More Flowers, More Ladies Pass really grabs me. You didn’t obey the sign!! Wonderful adventure account and photography…..very interesting & a real achievement.